01182013_Becherer_IraqMedical024: Doctors of War: Casualties of War: Global News Portfolio: New Orleans based Photojournalist covering the Deep South and beyond. Doctor Major Paul Phillips, left, and the medical staff of Landstuhl Regional Medical Center prepare to clean and evaluate Marine Lance Corporal Matthew Schilling’s amputated leg just hours after he arrives from Iraq. 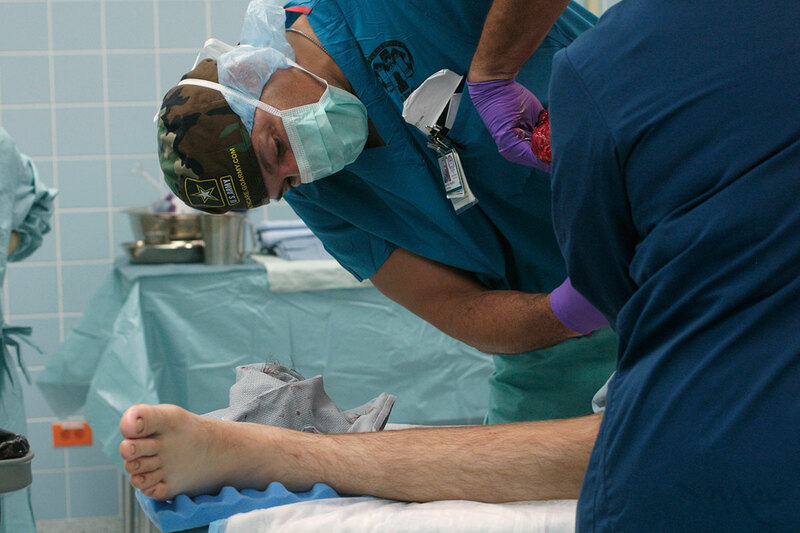 At this stage of treatment doctors are already shaping the amputated stump for optimal use with prosthetic legs. Bone that extends past the flesh must be cut back and the flesh cleansed for best recovery. With the majority of the wounds from Iraq accruing from roadside bombs, such operations are a daily procedure.